"My all-purpose rub I use when smoking ribs and pork shoulders. Store in a cool dry place. 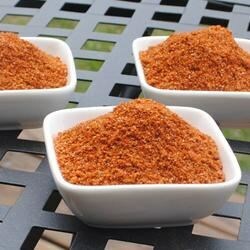 Sprinkle liberally on ribs and pork shoulder prior to smoking.`"
Mix the paprika, chili powder, brown sugar, white sugar, celery seed, black pepper, cayenne pepper, brown mustard, garlic powder, cumin, and salt together in a bowl. The flavor on this was great, but it's lacking on salt. The recipe calls for 1 tsp...1 Tbsp would be more appropriate for this amount of rub IMO. Awesome recipe... Hope you don't mind but we added a little freshly ground szechuan pepper (mixed in with the black peppercorns) and 2 tsp of onion powder. Yum!!! It's got a kick--a great one! I LOVE this rub!